It's raining cats and dogs! Felix & Fido are ready to come out and play. 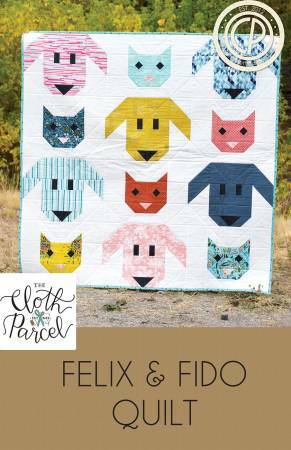 Choose colorful fat quarters to create a pet menagerie set against a contrasting background color. Simple piecing makes this pattern very beginner friendly, and quick and easy to sew. Included are instructions for baby and twin size quilts, but just increase the number of blocks to make this quilt any size. Furry friends unite!